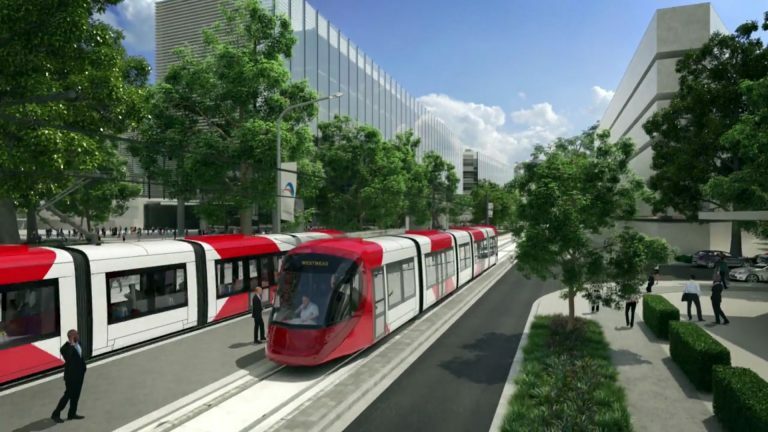 Stage 1 of the Parramatta Light Rail has final planning approval. Below we highlight the areas impacting cyclists. E12: Pedestrian and Cyclist Access Safe pedestrian and cyclist access must be maintained around work sites during construction. In circumstances where pedestrian and cyclist access is restricted or removed due to construction activities, an alternate equivalent route which complies with the relevant standards must be provided and signposted. E13: Bicycle parking/rack facilities are required to be installed at all light rail stops within the Carlingford precinct, unless these facilities already exist. (h) the requirements of relevant design standards, including Austroads and NSW bicycle guidelines. The Pedestrian and Cyclist Network and Facilities Strategy must be submitted to the Secretary before construction of pedestrian/cyclist permanent built works (including the Active Transport Link) commences and implemented to ensure that all works are operational no later than the commencement of CSSI operations. they have not provided for separated walking and cycling paths along the Active Transport Link (ATL) as we all requested, ie a Shared Path only. Which will quickly become crowded and a source of conflict.